1310 East Union Street, developed by Liz Dunn, designed by Miller/Hull. What makes this building exceptional is its modest size and scale. The lot is only 40 feet wide. It’s a 65-foot tall building but is not at all imposing from the street. 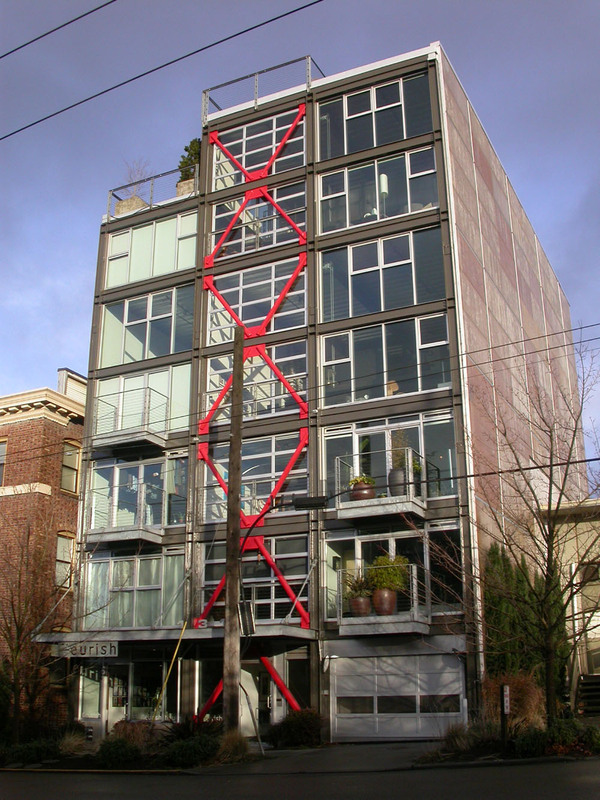 This building is a living example of how infill can be done without destroying diversity. Instead of mowing down and replacing a whole city block with a sterile, monolithic street frontage, as will be the case with the 500 block of East Pine and many, many other full block projects in Seattle, this development coexists peacefully between an older three-story brick apartment, and a nondescript one-story building that until recently (alas!) was home to the La Panzanella Italian bakery and cafe. The problem is that the economic equation drives developers to do too much too fast. It’s cheaper to do a full-block mass-produced building all at once, than to do several separate smaller buildings over time. Pathetically, a significant component in this equation is the requirement to provide parking. Underground concrete parking is expensive ($20,000 – $30,000 per stall), and stalls can be much more efficiently packed into bigger structures. So the question is then, what can the City do to encourage smaller-scale developments? *In 1973 E.F. Schumacher wrote a book called Small is Beautiful, Economics as if People Mattered. Posted by dan bertolet on	Saturday, December 22nd, 2007 at 12:29 pm. You can follow any responses to this entry through the RSS 2.0 feed. You can leave a response, or trackback from your own site. That building is nice. One thing the city *should* do is to move away from enforcing a mandatory minimum parking in favor of a san francisco mandatory maximum. That and build some actual mass trasit *ugghhh*. That is the only building my mom commented on during her visit to Seattle and she loved it. …this is one of my favorite building as well (but I might be slightly biased!). we owe it to our community to continue to advocate for great and responsible design! This is exactly what Seattle needs more of.